Fortesse shampoo accelerates hair growth and prevents hair loss. The shampoo has been dermatologically tested. The product is perfect for sensitive scalp. It does not contain SLS or SLES. What makes Fortesse shampoo unique? The unique formula of Fortesse shampoo contains vitamins and minerals which are necessary for healthy hair. We are certain of our products' effectiveness. 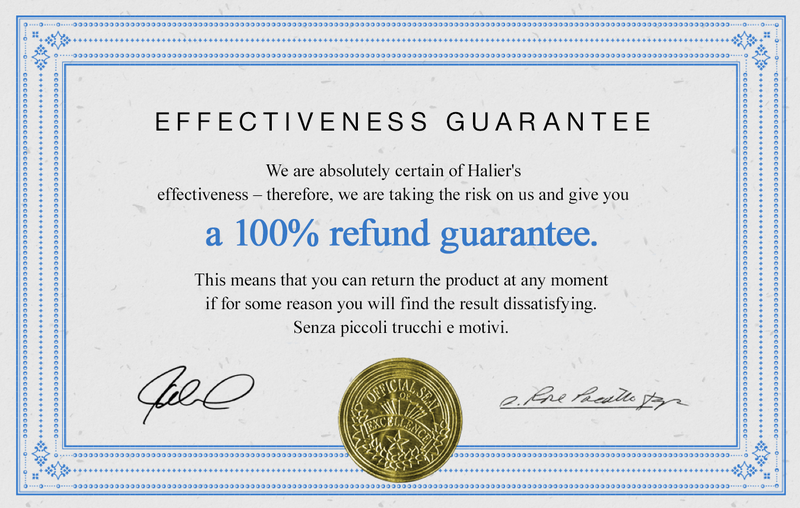 Therefore we offer you 100% money back guarantee. It means you can return the product within 90 days if you think it has not fulfilled your expectations. After my pregnancy my hair thinned a lot. My biggest problem was trying to constantly hide those bald spots. After I started using Fortesse my hair improved so much. I'm really happy with the results. Itchy scalp used to be my worst nightmare. Every shampoo I used caused some kind of allergy or itching. :( I also struggled with recurring dandruff. Fortesse shampoo helped me get rid of all the problems! :D Now I'm Halier number 1 fan. Yay! Fortesse is the best. :D My bleached hair was matt, dry and damaged. Fortesse gave it a second life! Some time ago my new hairdresser suggested I use Fortesse. I bought the shampoo at her salon and after only 2 weeks I saw the difference! My hair is no longer frizzy and the shine is great! TOTALLY recommend it! Since I was a little girl I've had weak hair. I was jealous of my friends' lovely pony tails and braids with cute, colourful hair clips. Now they can be jealous of my hair because after using Fortesse my locks grow like crazy! This shampoo is awesome! I'd tried loads of hair products. The cheap ones and the professional ones. Then I came across Fortesse. I think this shampoo is worth recommending. It worked great on my hair! Fortesse shampoo, enriched with Advanced Hair Booster™ formula, is a product boosting hair growth and preventing hair loss. Use: Apply the shampoo onto damp hair. Lather and gently massage the scalp with circular motions. Rinse well. The next step of hair care is using Fortesse conditioner. Ingredients: Aqua, Cocamidopropyl Betaine, Coco-Glucoside, Acrylates Copolymer, Glycerin, Silicone Quaternium-16, Olive Oil PEG-8 Esters, Panthenol, Phenoxyethanol, Xanthan Gum, Equisetum Arvense Leaf Extract, Sereno Serrulata Fruit Extract, Parfum, Mica, Niacinamide, Undeceth-11, Sodium Hydroxide, Ethylhexylglycerin, Disodium EDTA, Butyloctanol, Undeceth-5, Biotin, Alpha-Isomethyl Ionone, Butylphenyl Methylpropional, Citronellol, Eugenol, Geraniol, Hexyl Cinnamal, Hydroxycitronellal, Hydroxyisohexyl 3-Cyclohexene Carboxaldehyde, Limonene, Linalool, CI 77891. 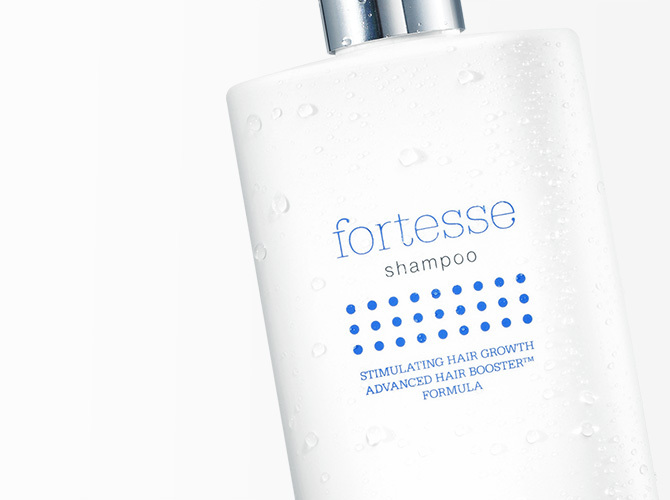 Results: Fortesse shampoo boosts hair growth and prevents excessive hair loss. It washes and strengthens hair, while preventing split ends. The unique Advanced Hair Booster™ formula conditions the follicles, regenerates the scalp and makes hair more flexible and bouncy. Hair becomes smooth, shiny and easy to style. The shampoo does not weigh hair down. The product has been dermatologically tested. Important information: If the shampoo gets into your eyes, rinse them well with water. Keep away from children. The product does not contain SLS or SLES. Who is Fortesse shampoo for? Fortesse shampoo is a product dedicated to women who wish to take care of their hair. The shampoo ingredients condition, replenish moisture and add shine to brittle hair. Fortesse prevents thinning and stimulates hair growth. The unique Advanced Hair Booster™ formula deeply nourishes follicles, improves hair vitality and regenerates the scalp. As a result, hair becomes super sleek, lustrous and easy to style. Is Fortesse shampoo dedicated to all hair types? Fortesse shampoo can be used by women with all hair types. The product revives dry, damaged, oily and prone to falling out hair. Yes, Fortesse shampoo has been dermatologically tested and does not cause scalp irritations. The shampoo does not contain harmful detergents such as SLS or SLES. What are the ingredients of Fortesse shampoo? The ingredients of Fortesse shampoo: Aqua, Cocamidopropyl Betaine, Coco-Glucoside, Acrylates Copolymer, Glycerin, Silicone Quaternium-16, Olive Oil PEG-8 Esters, Panthenol, Phenoxyethanol, Xanthan Gum, Equisetum Arvense Leaf Extract, Sereno Serrulata Fruit Extract, Parfum, Mica, Niacinamide, Undeceth-11, Sodium Hydroxide, Ethylhexylglycerin, Disodium EDTA, Butyloctanol, Undeceth-5, Biotin, Alpha-Isomethyl Ionone, Butylphenyl Methylpropional, Citronellol, Eugenol, Geraniol, Hexyl Cinnamal, Hydroxycitronellal, Hydroxyisohexyl 3-Cyclohexene Carboxaldehyde, Limonene, Linalool, CI 77891. How to use Fortesse shampoo? Apply the shampoo to damp hair. Lather and gently massage the product into your scalp with circular motions. Rinse well. The next step of hair care is using hair conditioner from Fortesse collection. How long does one Fortesse shampoo bottle last for? One Fortesse shampoo bottle is enough for 2-month use (with optimal use 3-4 times a week). Does Fortesse shampoo cure baldness? No. Fortesse shampoo does not cure baldness. Its ingredients, horsetail and biotin, boost hair growth and maintain healthy growth. Where can I buy Fortesse shampoo? Fortesse shampoo can be purchased via our online shop www.halier.co.uk, in selected hair and beauty salons and stores throughout the country. We are absolutely certain of the effectiveness of our products. Therefore we give you 100% money back guarantee. You can return the product if it has not fulfilled your expectations. Certainly. Having our customers' needs in mind we offer worldwide delivery. The delivery time, however, may vary.